BaiBoo was launched in 2007 and is Malaysia’s leading targeted marketing specialist to reach out to expecting and new mothers. They do this mostly in hospitals and online. BaiBoo helps their clients to have expecting and new mothers try their products and services. In addition to this, they aim to educate target audience with respect to pregnancy, health, baby care, breastfeeding and parenting. The communication channels allow them to send information and promotions to the right person at the most attractive moment. Their free gift bags, Mummy’s Tummy Bag and Happy Baby Bag reach close to half a million expecting and new mothers in Malaysia each year. Their Happy Baby Guide is read and appreciated by over 360’000 new mothers annually. 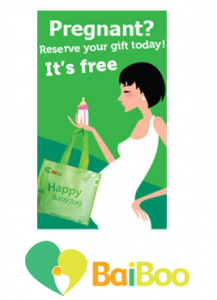 Register now and you will receive your Happy Baby Bag in the hospital when you give birth. BaiBoo works with most private, university and government hospitals in West Malaysia.